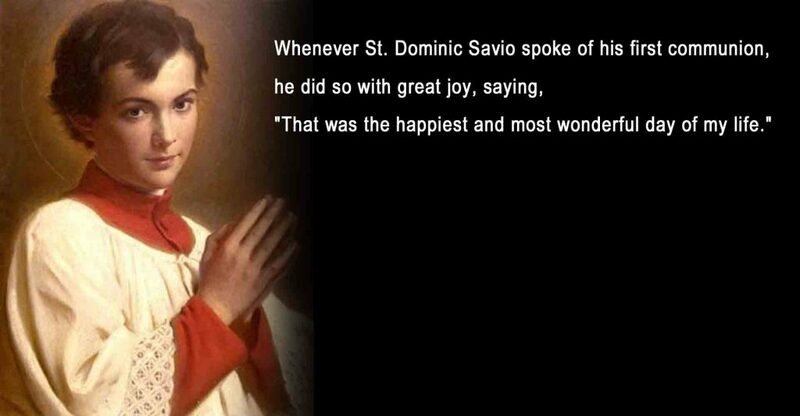 St. Dominic Savio was born to a peasant family in Riva, Italy. At age twelve, he became a student of St. John Bosco and began studies to become a priest. However, he suffered frequent health problems and died on March 9, 1857, at age fourteen. Known for his piety, zeal and devotion to the divine faith of the Church, he was canonized in 1954 by St. Pius X. Until I started to go to Mass regularly, I used to keep count of my Communions. I had received so few up to the fifth grade, that I could actually keep count. One can only imagine my shock, then, when I read about Saint Dominic Savio taking full advantage of his First Holy Communion and writing down four resolutions that can very beneficially affect our youth today. This resolution confused eleven-year-old me. Up to this point, I didn’t know what a confessor was. I wasn’t even taught what an examination of conscience is, and learned about it as an adult. I wasn’t even taught to say, “Bless me, Father, for I have sinned.” This last part I learned from a myriad of movies! And yet, I learned simply that I am not supposed to be afraid of the confessional, and to find a priest who will guide me as an individual and not be afraid to cut through my nonsense. John Bosco’s Three Lives: The Life of Dominic Savio, chapter 3. Something else I learned from this resolution, and what our youth should take note on, is that reception of Holy Communion is not a given. It is something you should be preparing for. It is something you should be receiving like it is your first one and your last one. Not only should we not take this Sacrament for granted, but we must not take this Sacrament for granted. Some are so scrupulous (Jansenists) that they do not receive Holy Communion even once a year, which is why Holy Mother Church instituted the Easter Duty. It’s no secret weekly Mass attendance has been declining. Most of my middle school CCD students don’t even know it’s a mortal sin to miss Mass without a valid reason on Sundays and Days of Obligation. I didn’t understand this myself until I started going with my neighbors in the fifth grade. Some of my kids (more than I’d like to admit) don’t even know Christmas or Easter are Catholic Holy days. They only know those days are important because they get presents. They do not know the holiness behind the joy. Some of my other kids understand these days are important for “religious reasons”, but how can they keep them holy? In short, my response is: Effort. Go to Mass, of course. Pray a Rosary, which only takes about fifteen minutes. Read part of the Bible. Read about a Saint you don’t know about. These things aren’t difficult and as for the last point, humans love to learn. Many of us just don’t like school. One piece of advice I gave my kids was to find a Saint whose story you like. Congratulations, you have a Patron Saint. Emulate that Saint. I’m still emulating Saint Dominic Savio, who has been my Patron Saint for eleven years now! I’m seven years older than he was when he died! Now here’s the problem…when I was in CCD, the emphasis was always that Jesus is my buddy, not my friend. Father Matteo said that one’s friendship with Christ is to be regarded as the friendship between a king and his subject (Jesus King of Love). The subject knows he has no power without the king. The king grants him favors because of his own power and goodness, not that on the part of the subject. In this sort of relationship there is reverence. The Liturgy, oftentimes, is morphed into a Christocentric pep rally. This is out of a lack of reverence. As grace pours from the Altar during the Holy Sacrifice, so does reverence pour from the example of the priest. Children learn by watching. Where there is no example, they learn nothing. This one was quite dark at the first read for eleven-year-old me. I thought immediately about the Apostles who were martyred, Saint Joan of Arc who was burned alive, and Saint Valentine who was beheaded. And here I was getting ready to die?! But death was not the emphasis for young Dominic. Courage was! Saint Dominic Savio appeals to the hidden warrior in all of us, the childlike desire to be strong – but we cannot be strong without discipline. According to some Carmelite writers, we are first to avoid sin, and then to avoid imperfections and the neglect of Our Lord’s inspirations. The key here is to take baby steps, and then to walk boldly. Then quickly. Then start running. And then, we will realize that we are striving to “Finish the course” (2 Tim. 4:7). Saint Dominic Savio, pray for us! Photo Credit: Coroinha Anônimo [Public domain], via Wikimedia Commons.